You are here: Home > Search for "d7"
Model 254 is a longer version of Model 253, allowing additional overhang and scope adjustment between rings. Available in Matte Black only. 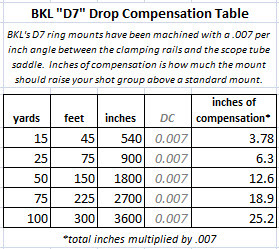 Model 260 is the strongest of the BKL mounts. With a sturdy 4 inches of clamp length and 6 dovetail clamp screws, this unitized mount is hard to beat. Model 260 is perfect for magnum airguns and semi-auto rimfire actions. Available in Matte Black only.